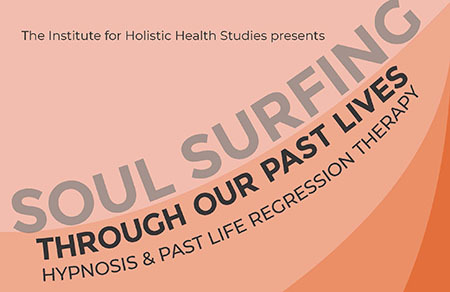 The Institute for Holistic Health Studies invites you to attend “SOUL SURFING THOUGH OUR PAST LIVES: Hypnosis and Past Life Regression for Healing” with Saundra Cindy Blum, MA. on Monday, November 5, 2018 at 7:30 pm. Ms. Blum is a Certified Ericksonian Hypnotherapist, Past Life Regression Therapist, Reiki practitioner, and international lecturer. She holds a Master of Science degree in Special Education and Counseling and a Bachelor of Science degree in English and Education. Saundra C. Blum is the co- founder of the Katonah Study Group for Integrative Medicine, and she sits on the Advisory Board for the Institute for Holistic Health Studies and on the Patient Advisory Board for Northern Westchester Hospital. She has a private practice in Somers New York and trains and certifies Past Life Regressionists in the USA, India, and Italy. Ms. Blum has authored two books, Footsteps through the Sands of time-Past Life Dramas, Present Life Lessons, published in November 2015, and the soon to be published The Bible Stories Through the Eyes of Past Life Regression. “These are intense times that can feel like chaos, confusion, transition, and transformation. What always felt known and safe feels very different right now. What is it that we need to know? What is it that we need to do? How can we feel more grounded and safe? “ Ms. Blum will share the insights that we can learn from our past that can help us move forward with grace and ease. As part of this presentation Ms. Blum will lead the audience in a sampling of a past life regression. A book signing will follow the presentation. Join us at 7:30 pm on Monday, November 5, 2018, in the Ives Concert Hall on the WCSU Midtown campus, 181 White Street, Danbury, CT.